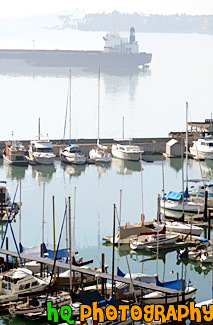 A scenic picture taken of many sailboats with a big ship in the background. This photo was taken in Tacoma, Washington by the Commenement Bay. Reflections of the sailboats can be seen in the water.